The International Association for Social Work with Groups, Inc. is the premier international association for social workers and allied helping professionals engaged in group work. The purpose of this non-profit, member-driven organization is to promote excellence in group work practice, education, field instruction, research and publication. The goals of this Association are realized through a program of action and advocacy at both the local and international levels. 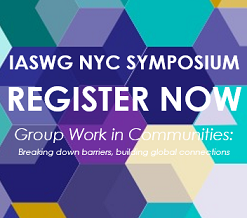 In addition to our annual symposia on social work with groups, now in our 34th year, IASWG is involved in an ongoing program to promote and develop group work practice. Our online newsletter and is utilized to bring members current news and timely information about group work and IASWG. Our website provides access to important articles, original content, and teaching resources. The Proceedings, a volume of selected papers from each symposium, is published each year. In recent years two books has been prepared to assist in group work teaching and practice. These have been published cooperatively with the Council on Social Work Education, and are entitled: Teaching a Methods Course in Social Work with Groups by Roselle Kurland and Robert Salmon, and Group Work Education in the Field by Julianne Wayne and Carol S. Cohen. A revised version of the Standards for Social Work Practice with Groups, first published in 1999, was published in 2006 and is available online in English and Spanish. Group work journals and books, such as the journals Groupwork and Social Work with Groups, and the Encyclopedia of Social Work with Groups, are available through the respective publishers, Whiting and Birch and Routledge. Many committees, chapters, and individuals are busy throughout the year. Members concentrated in fifteen areas in the world have organized chapters with active programs of workshops, communication, and action to develop practice and education. Other areas are in the process of organizing chapters. Also, of note, the John and Carol Ramey Endowment Fund has been established to provide ongoing support for the continuing development of IASWG. Your membership supports our mission. We invite you to join IASWG either on-line or by completing and mailing your membership form along with payment.